Emma Chase’s “Sustained” Available Now! Court is finally in session and Jake Becker is your man. Just one more day… then Jake Becker is yours. 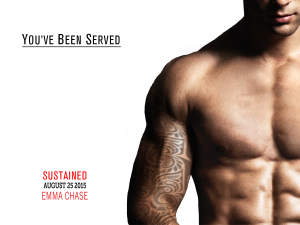 Emma Chase’s “Sustained” Releases August 25th! This Tuesday, court is in session and Jake Becker is your man. Emma Chase’s Sustained releases on August 25th! On August 25th, attorney Jake Becker’s motion for dismissal is going to be denied. Jake Becker isn’t your average defense attorney, but he’s never taken on a case like Chelsea McQuaid’s. Find out more in Emma Chase’s Sustained, available August 25th! “I lose myself in those clear blue eyes. Endless and cerulean, like tropical seas. And my voice is barely a whisper. ‘All the time. I can’t remember not wanting you anymore. 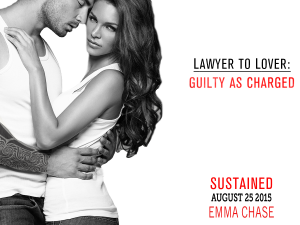 '” Check out the latest image in our #LawyerorLover campaign for Emma Chase’s Sustained, out August 25th! New Image for Emma Chase’s “Sustained,” Out August 25th! 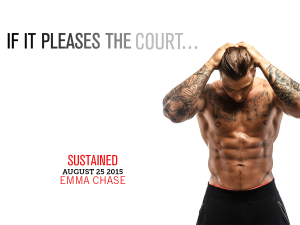 Emma Chase’s “Sustained” Available August 25th! “What the hell am I doing here? I don’t do complicated, I avoid distractions, and up until this point, that strategy has served me well.” Check out the latest image in our #LawyerorLover campaign for Emma Chase’s Sustained, out August 25th! Kyra Davis’ “Just One Lie” Available Now! “You’re the woman who is a complete mess and yet in some ways is more together than anyone else I’ve ever met. You’re the woman who has an angelic voice and devilish moves. 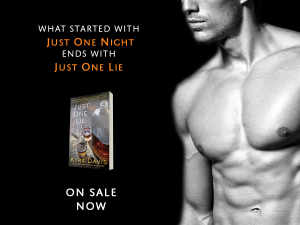 You’re the woman I’ve fallen in love with.” Kyra Davis’ Just One Lie is available now!